**EDIT** I know this is going to post later than the original date but I have been having some problems with blogger and being able to post!! Everything keeps coming up in HTML codes!! I'm back again--Wow two posts in one day!! LOL! Here are the rest of the Thanksgiving cards that I made. These cards were very fun, quick and easy to make! I also used limited supplies for making all of these cards. 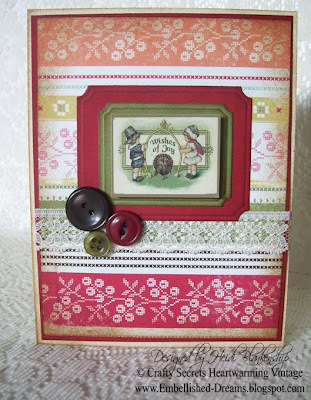 All of the vintage images are from Crafty Secrets Vintage Cuts, Autumn Blessings, one sheet of DP from Cosmo Cricket, CS from WorldWin, Spellbinders dies, a little lace and a few buttons. I also used a little ink around the edges of the paper and the die cuts to add to the vintage look. Thanks so much for stopping by (again!) today and I hope you have a wonderful Holiday Weekend!! I hope everyone had a wonderful Thanksgiving and you were able to spend some time with family and friends and have lots of yummy food! Paper~All of the paper used was from WorldWin ColorMates except for the watercolor paper. 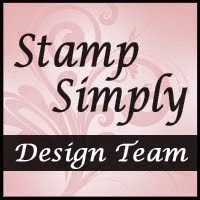 I also wanted to tell you about the terrific Thanksgiving sale that JustRite Stampers is having--It's called Buy One For Me & Get One FREE!! The sale ends November 30th so be sure to check it out!! You can find out all if the details about the sale by clicking HERE. Thanks so much for stopping by and I hope you have a wonderful Holiday weekend!! 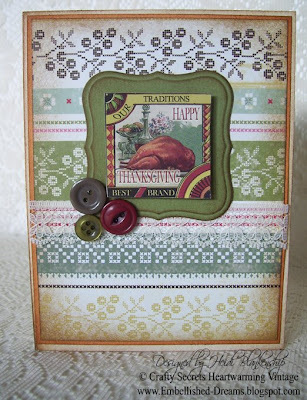 Stop back by soon as I have more Thanksgiving cards to share with you a little later today. This is just a really quick post to wish all of you a very Happy Thanksgiving!! I don't have any art to share with you today but I will have some tomorrow. ;) I made a few Thanksgiving Day cards but I wanted to wait with posting them until after they were given out so I will share those with you tomorrow. There are so many things I am thankful for in my life!! Family and friends are at the top of the list!! I am thankful for the many wonderful people I have met through my blog, online forums and DT's. You are all so creative, talented & inspiring and I cherish our online friendships!! I hope that however you spent your day that you were surrounded by the people you love and took a little time to think about all the things you are thankful for in your life!! *EDIT* Here is a question that I received in an email and I thought other people might be interested in the Q & A too. 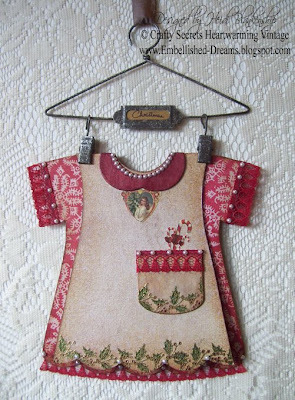 love the altered Sweet Chips dress!! Just adorable! All of your projects are just amazing. I always look forward to your creations. Thanks for sharing. Question-where do get those hangars that you used to display the dress card? Loydine, this is a wonderful question and thank you so much for asking! 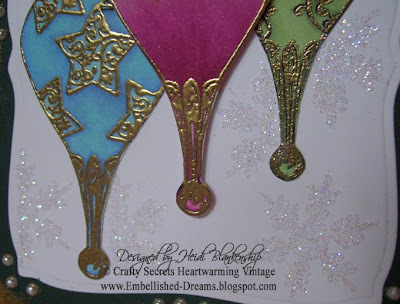 The vintage hangers are from Crafty Secrets. You can purchase them by going to the Crafty Secrets website. On the Crafty Secrets website look under the banner, there you will see tabs to click on for various items, click on Where to Buy. 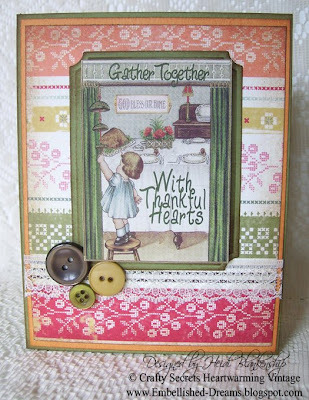 Doing this will open a new tab and on the left hand side in the tool bar you will see Heartwarming Vintage Collection (under Product Categories), click on this and then you will see where it says hangers. Ok, I know that was the long way but it is always good to know how to navigate around the website. Here is your "easy button"--LOL! Just click HERE and it will take you exactly where you want to be! Here is another question posted in the comments from Darlene.~Do you sleep at night or is your brain always working on a project?? Thanks so much for the great questions--keep them coming!! I know a lot of you know that Crafty Secrets carries Clear Stamps and beautiful Vintage Images but did you know Crafty Secrets also has some really fun alterable chipboard pieces? 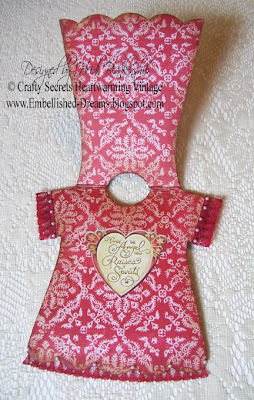 The Crafty Secrets line of chipboard is called "Sweet Chips"--I think that is the cutest name! Sweet Chips come in a variety of styles including little boy and girl outfits, a house and different shaped albums. For today's project I have the Little Girl Sweet Chips Outfit to share with you. The kit includes the little girls dress, 2 pockets, a collar, a solid flower, a larger flower that can be used as a buckle, 2 heart shapes that can be used as buttons and a bow. These are so fun and easy to alter! You can dress up the outfits using paper, ink, stamps, stickers, buttons, lace ribbons and any other fun embellishments you would like. I thought since the holidays are fast approaching it would be fun to dress up the little outfit for Christmas. I think these little outfits are so adorable!! The first thing I did was to pick out some paper that I thought would be pretty for Christmas in the traditional colors. 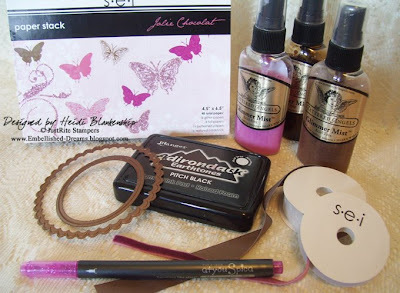 I used a sheet of paper from the Crafty Secrets Earthy Paper Pad. I traced the shape of the dress onto the back side of the paper, cut it out and then glued it to the piece of chipboard(on the inside of the outfit--see the picture below). Then I used Ranger, Distress Ink, Vintage Photo around the edges and added a pretty sticker from Crafty Secrets Heavenly Christmas sticker sheet to the center of the inside. On the front of the dress I used Tattered Angels, Glimmer Mist, Old Lace--it give the dress a vintage look and also adds a little shimmer. 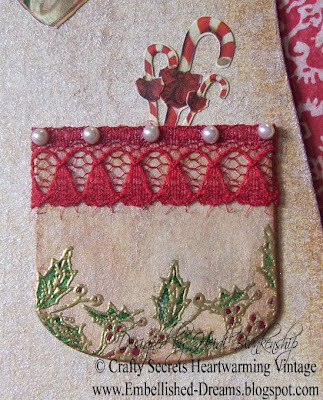 Then using WaterMark Ink from ClearSnap and the Holly stamp from Crafty Secrets Christmas Joy stamp set I stamped and embossed a holly border along the bottom of the dress and the pocket with gold EP. To color in the holly I used Twinkling H2O's, Green Tea and Hot Cinnamon from LuminArte'. If you haven't ever used Twinkling H2O's and you are maybe wondering what they are, they are simply watercolor paints with a beautiful shimmer. They come in little containers (pots) and all you have to do is mist them with a little water to activate them. I also used the twinkling H2O's to paint the collar on the dress. As you can see in the pictures I also added a few sticker to the dress. For the pocket I used candy canes from the Christmas Memories sticker sheet and the heart by the collar is from the Heavenly Christmas sticker sheet. 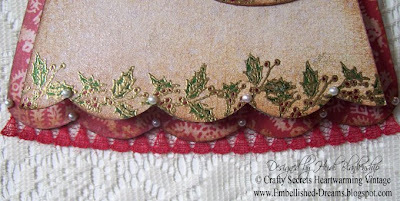 For a finishing touch I added some dark red lace trim and some pearls. Thank you so much for stopping by today! 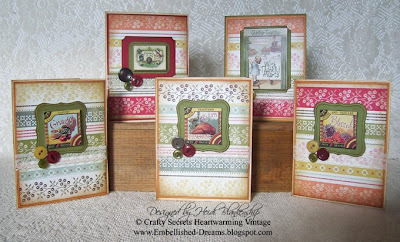 Don't forget to check out Crafty Secrets Gallery and Blog, I know you will find all kinds of inspiration for creating your own vintage papercrafts. I hope you are having a Wonderful Week!! *EDIT* Here is a question that was asked in the comments. All I can say is WOW! This is amazing! My son is a drummer, and he would LOVE something like this. I've read and reread your instructions several times, and I still don't understand how you made it. I'm not familiar with Gesso or any of the other products. Is that a pic of him? And why was there a pic of a sand castle...is that the original piece that you altered. I'm assuming you painted over the sand castle. Sorry for all the questions, I'm just a little confused. But I really, really, love this! 1. Paint canvas with white acrylic paint. 2. Use a sponge roller to add the Gesso, but you don't want it smooth--go in different directions with the sponge roller giving it some texture. 3. 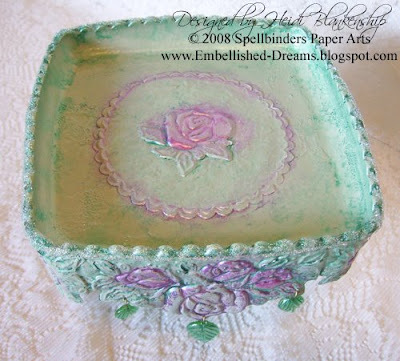 Once Gesso is dry add Glimmer Mists (a liquid shimmer spray) until you get the look you would like. 4. Lightly sand and then add embellishments. 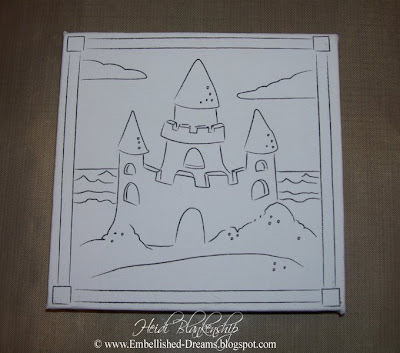 The picture with the sandcastle is just to show a before picture of the canvas. Also something to keep in mind, if you can purchase the canvas like this (something that is meant for a kid's craft) it will be a lot less expensive than the canvas from the paint department. Amy, thanks again for the great questions and yes that is a picture of my son. If you have any other questions just let me know. I love hearing from all of you and I will try to answer any questions I can. Sometimes it can be hard to design something that is very masculine and even harder to design something for a young man in his teens. Our oldest son falls into that category and though he sees my design work and tells me it looks nice I wanted to design something that would even make him say WOW!! In the earlier part of the year our son and some of his friends got together and started up a band. Unfortunately between summer vacations, school, homework and jobs they are a little limited on their practice time. Although we haven't heard the band play together yet a father of one of the other boys reassures us that they are coming together as a band. Our son LOVES to play the guitar and spends most of his free time doing just that! I thought it would be great to design something just for him so I went searching through my box of alterable things and I found a small 5 x 5 canvas to alter. Here is a picture of the canvas before I started working on it. I have a few of these and I think I purchased them this summer at the local $ store but I can't remember for sure. The first thing I did to the canvas was to paint it with a white acrylic paint and then I covered the top with gesso. When I applied the gesso I used a sponge roller going in all different directions to give it some texture. After the gesso was dry then I spritzed two different colors of Tattered Angels Glimmer Mist, Black Gold and Slate onto the canvas and carefully used a heat tool to set the colors. I applied a few coats of the glimmer mist to get the look I wanted. Then I lightly sanded the top of the canvas. 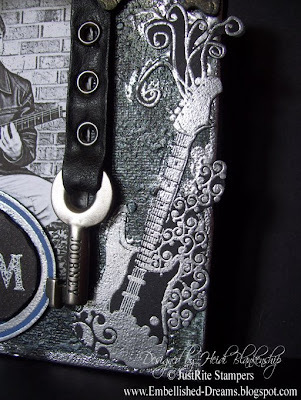 I also went around the canvas with Pitch Black Adirondack ink and embossed the edges using a silver EP. I took a few pictures while I was doing this but the light wasn't the best and the pictures are so dark you can't see all of the detail. :( But at least you know how it was done and you can see some of the background detail on the finished project. Here is a picture of the finished design. It's a little canvas but there is a lot of detail and a whole lot going on! 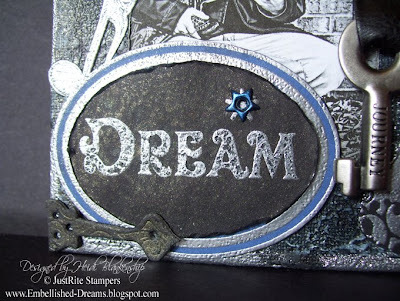 For the focal point I used the Dream stamp from the JustRite Harmony Classic Oval Stamper II Stamp Ensemble. This set comes with 6 Designer Borders & 6 Designer Centers along with an Oval 2-1/4 x 3-1/16 Harmony Stamper. The Designer Centers include the words Dream, Inspired, Believe, Explore, Create & Imagine. Here's a couple of close up pictures of the oval Dream stamp. To stamp the image I used Adirondack, Pitch Black Ink. 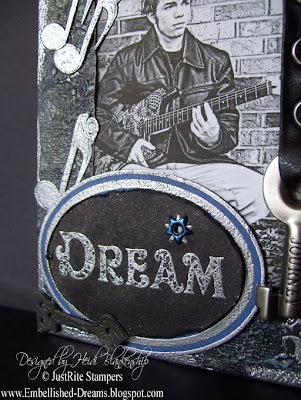 I stamped the image twice using two different colors of WorldWin ColorMates CS, Deep Belgium Blue and Deep Heritage Black. I used a silver detailed EP on both pieces and then cut them out. I also added a blue star eyelet on top of the star from the stamped image. I mounted the two oval pieces onto chipboard and then layered them. After they were layered I slightly distressed the edges of the black CS. Then I misted them with Black Gold, Glimmer Mist from Tattered Angels and heat set again. By doing this it gives kind of a distressed look to the EP which I think is a great effect. I also used the Rock Star stamp set from Inkadinkado for the music notes and guitar. Using Adirondack, Pitch Black Ink I stamped them onto WorldWin ColorMates CS, Deep Heritage Black and embossed with detailed silver EP. Then I cut out each piece and applied it to the canvas as shown. 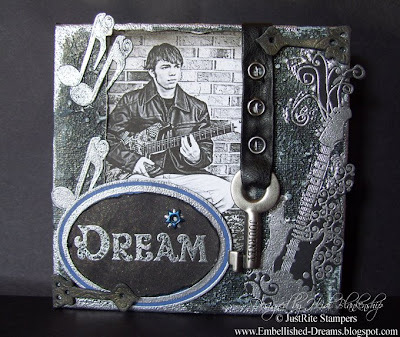 For the embellishments I used one of the Tim Holtz idea-ology Word Keys ( JOURNEY) which I attached to a piece of leather trim using my Crop-A-Dile and silver eyelets. I LOVE those keys!! They just add so much to a project! 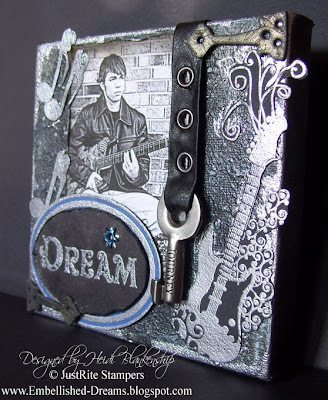 I also used two pieces of Tim Holtz Grungeboard, Elements Swirls and misted them with more of the Black Gold Glimmer Mist. And YES for those of you who might be wondering the young man in the picture is my son and YES he did say WOW this looks Amazing mom!! *wink* I took this picture of him just for this project. I hope you enjoyed seeing all the pictures of my altered canvas! I would love to hear what you think and if you have altered a canvas I would love to see a picture--leave me a comment or a link! 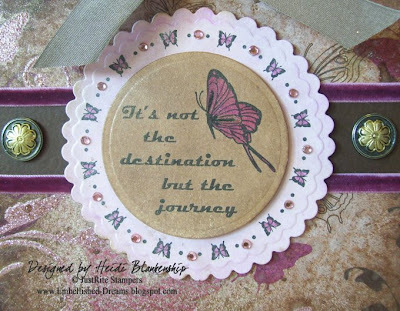 Don't forget to check out the JustRite Blog and Gallery for more JustRite Stampers Inspiration. Hope you have a Terrific Tuesday!! Cynde, thanks for your great questions! To answer your questions the foil that I used is a crafting foil from AMACO and yes normally it is very flexible/bendable but on each piece the backside was filled in with a clear silicone which will firm up when it dries. By doing this it will help to hold the shape of the embossing so when you touch it, it doesn't smoosh back in. On the larger pedestal piece, once the silicone was dry I also added hot glue on top of that to firm it up even more. I HTH!! Thanks again for the great questions!! First before I share my project with you I wanted to let all of you know Spellbinders has a Beautiful NEW Website!! 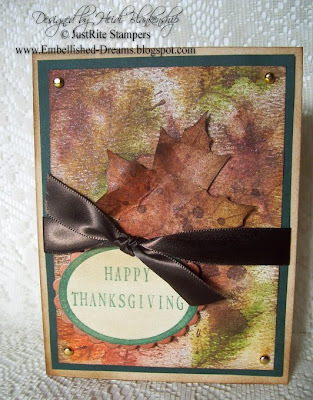 You can check it out by clicking HERE or click on the Spellbinders Blinki in my sidebar. Be sure to stop by and take a look around and you can also see all of the amazing art pieces from the Spellbinders Design Team. Guess What??? 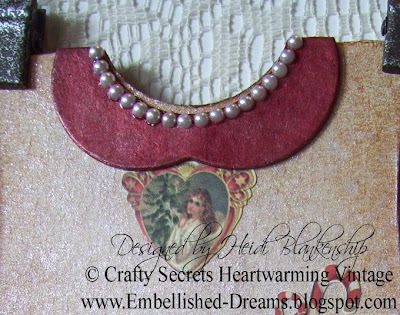 I have even more exciting NEWS--Spellbinders now has a BLOG!!! 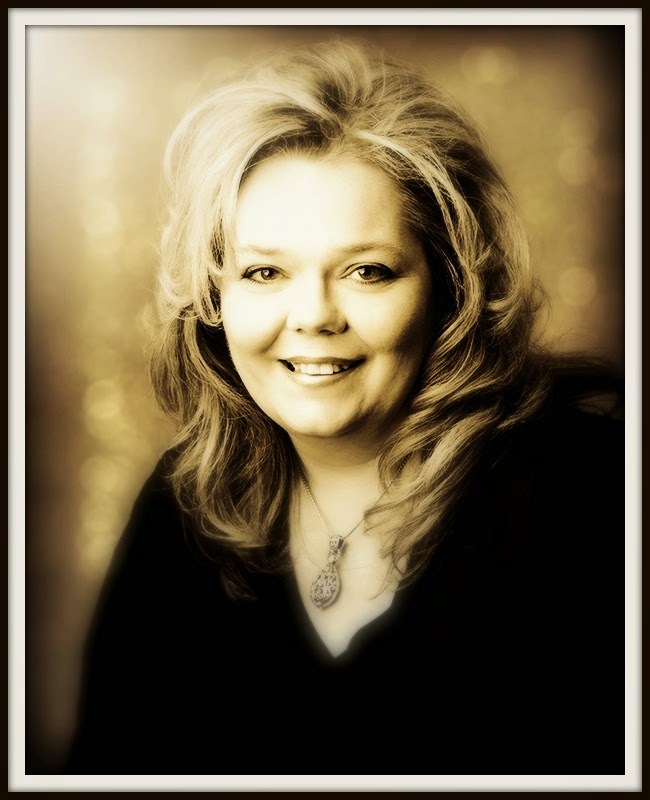 To see the NEW BLOG you can either click HERE or when you are on the Spellbinders Home Page you can find the blog under SHOW & TELL. 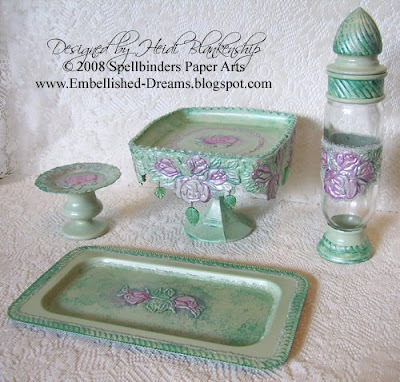 I have also added the link to the blog in my sidebar (under Spellbinder DT Ladies). When you're done here be sure to check it all out--they are giving away some BLOG CANDY!!! For the month of September we (the Spellbinder's DT) were asked to do some type of an ensemble for our monthly gallery projects. I love being able to do ensembles and I also love being able to find something at the local thrift store or $ store that I can alter! So I headed down to the local thrift store to see what I could come up with. I wanted to try and design a dressing table ensemble. My first find was a tall unique looking glass container with a lid and then I found a square glass dish, a couple of candles holders and a couple of metal trays. I was off to a good start! Here is a picture of everything before I started working on it. **NOTE--one thing that is different in the picture--I swapped out the wine glass for a larger candle holder. I know it doesn't look like much, right? But check out the picture below with all of the finished pieces!! Here is a picture of the Dressing Table Ensemble once it was finished. The first thing I did was to make the two pedestal pieces. To do this I used a clear sealant to glue the glass pieces together. On the larger one I used the square glass dish and the larger candle holder. 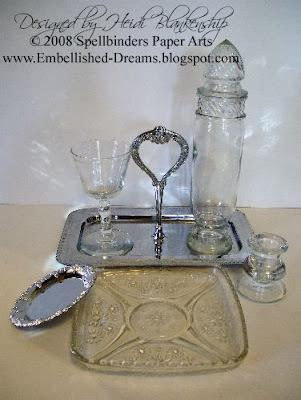 For the smaller one I used the small circle metal tray and the small candle holder. These had to dry for about 24 hours. To do the embossed metal roses I used the Wizard from Spellbinders along with the NEW Borderabilities Grand 12" Rose Border(S7-001), Rose Blossom Edgeabilities (S4-044), Petite Scalloped Circle Nestabilities Lg. (S4-115), and craft foil from AMACO. On each of the pieces I cut and embossed the foil and then glued it onto each piece. The only one I did differently was the tall glass container. For this piece I painted the backside of the foil because it would show through to the inside of the glass. Once it was painted then I glued it in place. The steps varied a little for each piece but they were all sprayed with a primer, and then sprayed with celery paint from Krylon. For the tall glass container I used painters tape around the center part so it would remain clear. 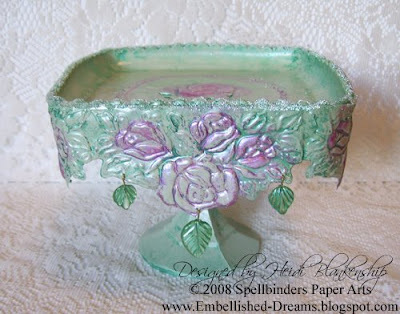 To do the detailed painting I used rose and emerald colored enamel paints. Each of the pieces have a bit of a distressed finish on the paint and all I can say is thank goodness for accidents! While I was working on this some of the enamel paint was a bit too heavy and I was trying to get it off. I used a damp cloth and it would not come off so I added a little soap and it was still on there. In a hurry I sprayed some Lysol kitchen cleaner and it did the trick! It pulled just enough of the paint off to give it a distressed look. So as I went along I painted, sprayed kitchen cleaner and blotted with a paper towel. I also added clear micro beads on each piece and on the larger pedestal piece I punched a few holes and added some leaf shaped beads. Here are some close ups of each of piece and a little bit about how I did each one. As I stated above this piece was done a little differently. The band around the center was done using the Borderabilities Grand 12" Rose Border(S7-001) die and then I added the clear micro beads around the edges of the foil. 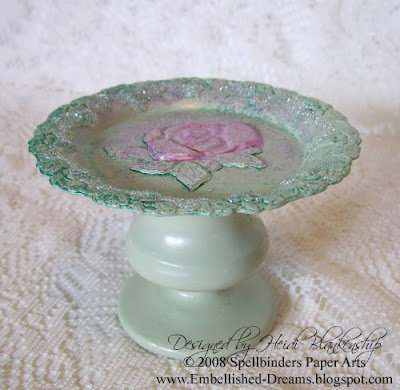 For this piece I used the larger rose from the Rose Blossom Edgeabilities (S4-044) die and then I added the clear glass micro beads around the edges of the top. 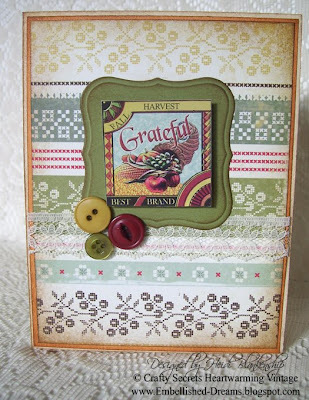 I hope you have enjoyed my Spellbinders Design Team project. Then next time you're at the thrift store or the local $ Store see if you can find some simple everyday items and turn them into something beautiful. I hope you have a Wonderful Weekend!! 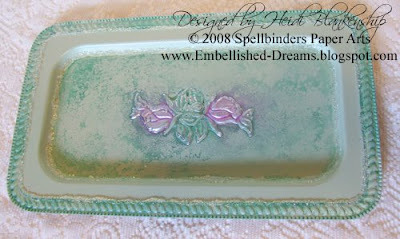 Don't forget to check out the NEW Spellbinders Website & the NEW Blog with some sweet BLOG CANDY!!! Wow, I know that was a lot for a title! 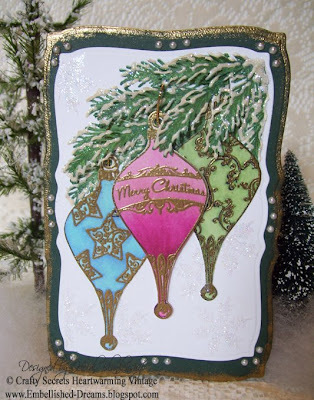 I have been playing around with both of the NEW Christmas Stamp sets from Crafty Secrets that were just recently released, Christmas Joy & Snow Bunnies. 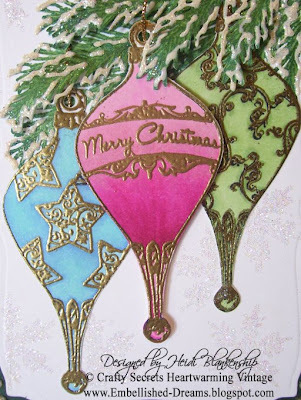 The Christmas Joy stamp set has so many different possibilities!! You can design the Christmas ornaments in many different ways, make lights & garland just to name a few things. The Snow Bunnies set is so darn cute, those little bunnies are just adorable!! 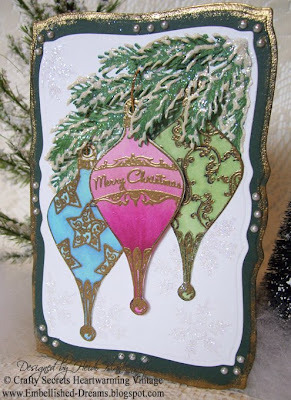 Here is one of the cards that I made yesterday with the Christmas Joy stamp set. Also I used the NEW Mega Nestabilities Curved Rectangles from Spellbinders to make the card shape. Thanks so much for stopping by today! If you try the embossing technique with the Copic markers I would love to see it, so leave me a comment and a link to your card. I hope you are having a WONDERFUL WEEKEND!! Happy Election Day! I hope you were all able to get out and VOTE! Sorry I have been MIA for a little while! 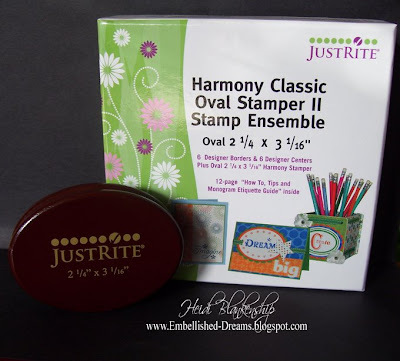 I have a really fun stamp set from JustRite Stampers and a card to share with you today. Before I get to all the details of the card I have to tell you about this incredible stamp set. 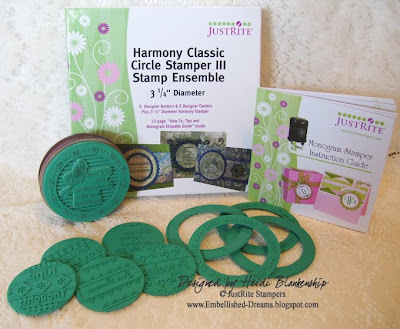 The stamp set is called Harmony Classic Circle Stamper III Stamp Ensemble, it comes with 6 Designer Boarders & 6 Designer Centers along with a 3 1/4" Diameter Harmony Stamper. 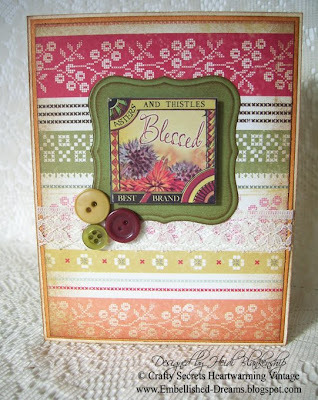 One of my favorite things about the JustRite Stampers is that the borders and centers are ALL interchangeable! Using the borders and center and also the different fonts you have so much flexibility and can custom design the stamps to your own personal likings. 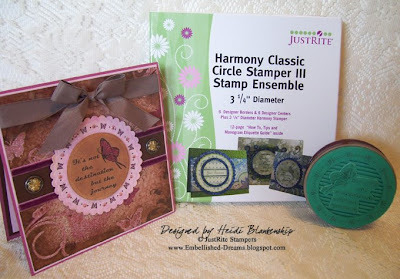 Here is a picture of the Harmony Classic Circle Stamper III Stamp Ensemble. As you can see in the picture above the image of the butterfly has been cut. Here is a close up of the stamp. Guess what!? 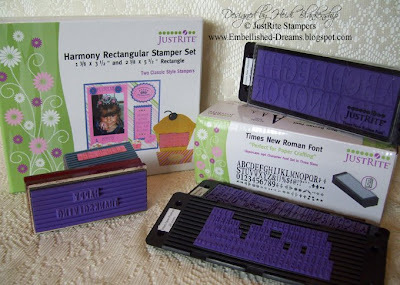 It's ok to cut off the extra rubber on your stamps! Once in a while you can get an unwanted ink mark from the excess rubber on the stamp but a very quick an easy way to resolve this is to just cut around the image and you will have perfect results. Another thing I would like to mention is if you have some images that aren't getting as crisp of an image as you would like you may need to condition your stamps. 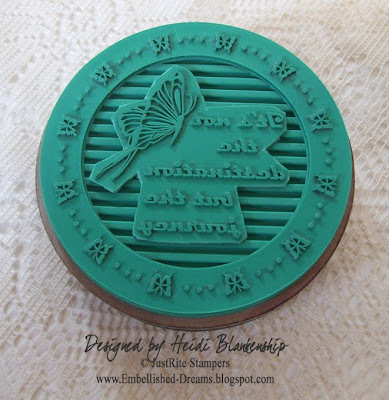 Sharon Johnson did a fantastic tutorial to show you how easy and quickly you can condition and cut your stamps. Her tutorial is on SCS and you can find out all of the details by clicking HERE! Other~Spellbinders-Wizard, Classic Circle Nestabilities S4 114, Petite Scalloped Circle Nestabilities S4 115, Copic-Spica Pink Glitter Pen, Tattered Angels-Glimmer Mist Snow Angel, Old Lace, Suede, sei-Ribbon, Joann's-Decorative Brads, Pink Rhinestones, Foam Tape, Beacon-Zip Dry Thank you so much for stopping but today! Don't forget to check out the JustRite Gallery and the JustRite Blog for tons of inspiration. Hope you are having a Wonderful Week! !